All of the reactors in Japan were shut down subsequent to the nuclear disaster at the Fukushima Daiichi site on March 11, 2011. Since that time there have been extensive efforts addressed at recovering from the worst nuclear accident in the history of commercial nuclear power. Since the accidents the question was and has been asked over and over about the possibility of restarting any reactors in Japan. The nuclear industry in Japan has been slow to collectively assess the nuclear accident and perform detailed lessons learned and implement corrective actions across the nuclear complex in the country. Some utility companies have done more than others but for the most part they have relied upon what the government regulators have issued as actions that must be completed prior to restart of any facility. In efforts to deal with rising concerns from the public as well as regulators, Japan re-organized its regulatory structure and, with the help of foreign nuclear agencies, developed what was known as STRESS TESTS which would be performed at every nuclear facility wishing to restart. The stress tests attempted to perform an assessment on nuclear facilities and was the main effort to improve the safety posture at nuclear facilities. As the agencies changed in Japan and the more recent Nuclear Regulatory Authority (NRA) took over, the stress test was abandoned and NRA took over the responsibility to review submittals from commercial nuclear utilities hoping to restart their reactors. In addition to the NRA implementing this strategy, multiple lawsuits were filed in the court system which have resulted in the delayed start of any nuclear facility. Our group knows of two lawsuits, one on the Takahama nuclear plant which resulted in an injunction on that reactor barring restart. The other lawsuit against Sendai failed. At the current time, the earliest time for a reactor restart is Mid July/August, 2015 for the Sendai #1 reactor. 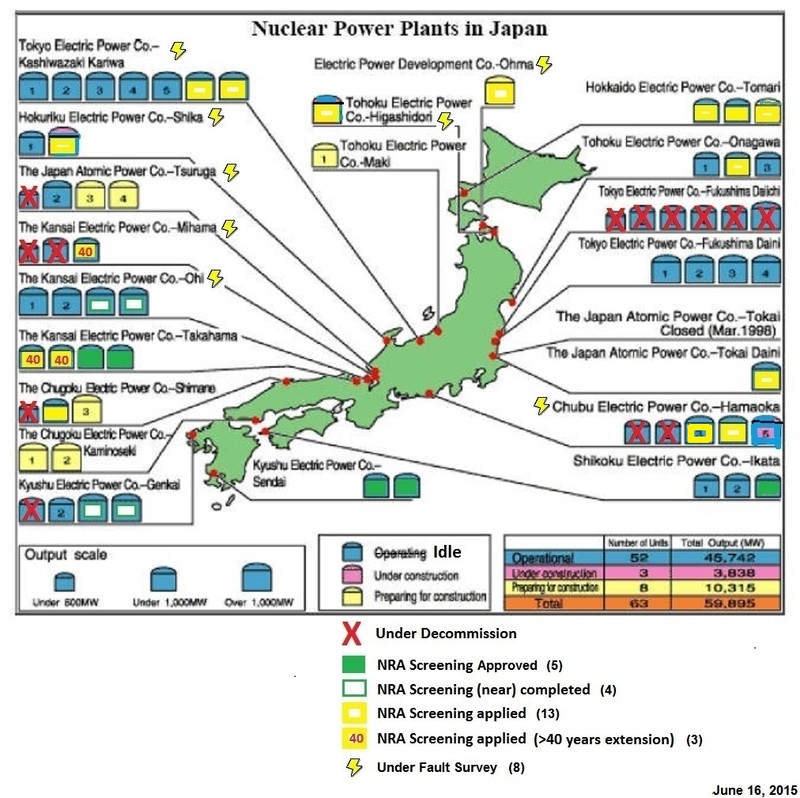 A member of our group (Simplyinfo.org) has compiled a map of Japan showing the commercial power reactors and an NRA screening status of each one. When reactors are placed in a prolonged shutdown, many complex maintenance, detailed inspections, modification and upgrades are put into a hold pattern. There is no known assurance that shutdown risk has been applied to the reactors in Japan as they have been in extended shutdown. Operation of plant nuclear and non nuclear systems have not been well documented nor published for the public to review. Now at the brink of approaching the restart of the first nuclear reactor, many questions must be answered to successively and safely proceed with the first re-start. In an attempt to highlight some of the factors which must come into play at a reactor facility planning to restart the following information is being made available for consideration. The process of restarting a commercial nuclear reactor (BWR or PWR) involves utilization of operational readiness reviews covering broad areas with respect to verifying the readiness of personnel, procedures, programs, and equipment. The following generic list is an example of items that would need to be reviewed typically by a review group which is formed by the governing agency like DOE or NRC in the case of USA facilities. In Japan the NRA would likely perform these detailed evaluations to assess readiness for a reactor to restart. Line management has established safety management programs to ensure safe accomplishment of work. Functions, assignments, responsibilities, and reporting relationships, including those between the line operating organization and environment, safety and health support organizations, are clearly defined, understood, and effectively implemented, with line management responsibility for control of safety. The selection, training, and qualification programs for operations and operations support personnel have been established, documented, and effectively implemented. Level of knowledge of managers, operations, and operations support personnel is adequate based on reviews of examinations and examination results, selected interviews of managers, operations, and operations support personnel, and observations of operational demonstrations. Personnel exhibit an awareness of public and worker safety, health and environmental protection requirements and, through their actions, demonstrate a high-priority commitment to comply with these requirements. Worker safety and health requirements have been implemented within the facility. The Tier 1 material, which is derived from the more-detailed Tier 2 document, provides high-level information on the plant design. As such, it includes the principal performance characteristics and safety functions of the plant’s structures, systems, and components (SSCs). It also includes inspections, tests, analyses, and acceptance criteria (ITAAC) to provide reasonable assurance that the as-built plant will operate in conformance with the license and applicable regulations. The separate Tier 2 document provides more-detailed information on the plant design. Technical Safety Requirements (TSR) are specific requirements that are developed for the facility based on the Final Safety Analysis and are unique for each reactor. The requirements are typically on parameters of operation such as temperature, pressure, flow and core physics such as power levels etc. All equipment and systems would have to have preventive, periodic maintenance and periodic checks brought current to the date of planned restart. The facility systems and procedures, as affected by facility modifications, are consistent with the description of the facility, procedures, and accident analysis and assumptions included in the safety documentation. Adequate and accurate procedures and safety limits are approved and in place for operating the process systems and utility systems. The procedures include necessary revisions for all modifications that have been made to the facility.This would also include all the new safety systems NRA made them add to the plants. A routine operations drill program and an emergency management drill and exercise program have been established and implemented. Records for each program are adequate to demonstrate the effectiveness of completed drills and exercises as well as planning for future drills and exercises. A planned reactor core fuel assembly loading which is selected to support a phased restart with different reactor power level holds to verify all instrumentation, criticality monitoring etc is as planned. The reactor fuel assemblies would have been removed from the reactor and would all have to go through pre-insertion testing to ensure integrity. The formality and discipline of operations are adequate to conduct work safely, and programs are in place to maintain this formality and discipline. Formal agreements between the operating contractor and (NRA/governing authority) have been established via the contract or other enforceable mechanism to govern safe facility operations. An effective feedback and improvement process has been established to identify, evaluate, and resolve deficiencies and recommendations made by contractor line management and independent contractor audit and assessment groups. The process also provides for resolution of issues and recommendations by external official review teams and audit organizations. The breadth, depth, and results of the responsible contractor/Japanese utility internal readiness reviews, including corrective actions, is adequate to verify the readiness of hardware, personnel, and management programs to support nuclear operations. Long term affects on systems which have been idled for extended periods of time. The following issues can develop on identified systems as well as operators and technical staff due to extended shutdown periods like those in Japan. 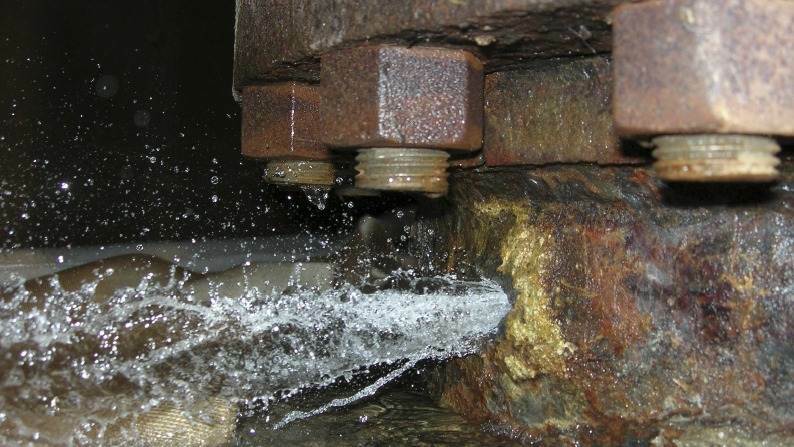 Systems which require chemistry control to avoid unwanted corrosion, build up of chemicals which can cause the production of biological conditions, crud build up on interior surfaces and uncontrolled Ph which can result in developing an acid low Ph condition. All systems at a nuclear facility have to maintain control of the prescribed chemistry. Electrical switchgear and electrical components sitting for long periods with no operation can develop corrosion build up on contacts which can cause switching problems/failures unless proper maintenance is performed on the standard periodicity. On March 22, 1983, Susquehanna Unit 1 was being prepared for a startup with all control rods fully inserted. The reactor mode switch was placed in the startup position in order to perform a surveillance test. Following the completion of the surveillance test the mode switch was returned to the shutdown. position which design produces a full scram signal. However, this time, the reactor protection system (RPS) channel “B” failed to actuate, and only a half scram signal was produced. The operator verified that all control rods remained fully inserted, and the operator depressed the reactor scram buttons as a precautionary measure. The manual scram actuated both channels of the RPS. The mode switch was test cycled several times and proper operation was intermittent. The switch was removed and a replacement mode switch was acquired from the NSSS supplier. Testing showed that there was improper contact continuity and this replacement switch was also deemed unacceptable. Four additional mode switches were acquired and all four mode switches successfully passed a bench test. One was used as a replacement. On May 16, 1983, Susquehanna Unit 1 was again being prepared for a startup. The reactor mode Switch was placed in the refuel position and immediately a scram signal and a group 1 isolation signal were generated. When the mode switch was placed in the startup position, the signals for a scram and a group 1 isolation were again produced. The reactor mode switch was a recently installed modified version of the type used in the March 22 event. The startup was, suspended until an acceptable replacement could be obtained.